1. Is TV Web Discovery a browser or an app? People seek video when they are at a screen with a mike and not a keyboard. They don’t want to type their desires. TV is visual and vocal. Video is kinesthetic. Not textual. Why search and discover kinesthetic media with text? Why not search with movement and sound? Viewers want to move, point, gesture, converse, order, command! Viewers want recommendations, a personalized menu that suits their mood, because most often they don’t know what they want. TVs are fast becoming communicators, so tv search and discovery will align to more telephonic and telepresence models. TV viewing is more social, narrative and linear which requires more personalization than a browser text box can offer. Discovery will often be managed in a secondary or fractional screen and on my different screens. MOST IMPORTANT: Because 80% of viewers stop watching ads today. Only 20% of TV viewers watch ads: the multi-screen crisis! This June Comcast will be announcing X2 – its next generation tuning OS, and “magical mobile” in collaboration with rival Verizon – even before X1 is rolled out nationally. One thing is for sure. The new video search is going to make a lot of money, because if SEO is a big business, then Visual SEO—with “native”, personalized, relevant advertising that emerges alongside video search and discovery—will be bigger by the end of this decade. People respond to and accept relevant ads when they are in search and “tuning” mode, and when working within a trusted application. Native TV Web marketing will be without exception rich, relevant, social, personalized, and immersive. Native TV Web marketing will enable ubiquitous, one-click purchase options and viewer engagements. 2. Which search approach wins? Which search engine will dominate the TV Web? Today Google / You Tube dominates both text search and web video with 2/3 market share of each. But people don’t turn to Google as a way to tune their tv or their mobile device or to learn “what’s on?” So where will people turn in the converged future of “TV Web”, and how can video publishers thrive? We think winner will be… The company to which you entrust your personalization cloud data. Our reason is that your personal information (address book, searches, shares, updates, content views, calendar, correspondence, profiles, social networks, cohorts, hang outs, mobile cloud) will drive the best personalized video search results. Which company is going to win the battle to host your personal cloud in the next decade? We think it’s unlikely to be the incumbents: Amazon, Apple, Comcast, Facebook, Google. Because each is in a battle to win the personalization cloud share on their own and not on the individual’s terms. We think the biggest TV discovery opportunity will come from the company that gives people the power to control and monetize their own personalization cloud of data – to let people control with whom and how it’s shared, monetized, and utilized by others. The emerging winner will be a new company that takes an all-new approach to person-controlled and person-centered rather than “machine” controlled personalization data. Before the decade is out all video will be language-powered video: all video will naturally and necessarily contain time coded captions and translated subtitles, upon which both machines and humans will be able to perform pinpoint search, contextualization, navigation, sharing, browsing, remembering, and learning. Follow these links to get started language powering your video for the TV Web future at no cost. Caption your videos! Even if only your best performing ones. Embed your video transcripts into your web pages, and dramatically improve SEO. Create engaging web pages adding interactive video transcripts. If you have more than 100 minutes of video on the web, take advantage of Dotsub’s offer to caption and translate up to 10 minutes (a free offer worth up to $250). If you have less than 100 minutes, sign up for a free Dotsub account and start captioning your own videos on our easy-to-use platform. Captioning on Dotsub is easy, fun, and free. All you need to do is create a Dotsub account, upload your video, and our free service lets you caption, download the transcript, publish to your YouTube, BrightCove, Kaltura, Ooyala, LongTailVideo, or Wistia account—and more. For little cost, you can also order burn-ins, voice dubbing, or have Dotsub professionally caption or translate your videos. Here’s how Joy Marcus – venture capitalist and former web video executive – framed the opportunities for Video search and discovery. 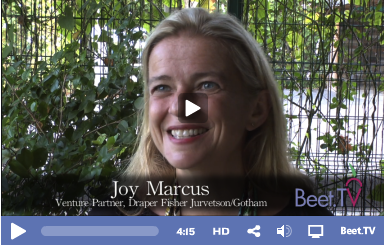 Joy Marcus, Venture Partner at Draper Fisher Gotham, at the Beet.tv conference. What is “TV Web”? Does it create new revenue models? People spend the most leisure time–4 hours a day–watching TV. TV is immersive, kinesthetic, and emotional as compared with text-dominant web. TV will soon be everywhere, interactive, and hyperlinked like the web. Brands are becoming media companies in which personalized, “native”, and content marketing will prevail over broadcast marketing models. The demise of broadcast marketing models in favor of “native marketing” models will be good news for Dotsub’s customers who are non-broadcast, “long tail” video publishers. (Dotsub’s customers are video publishers not in the top 50). TV Web will level the playing field for new, innovative video publishers and for innovative brands that deploy video.As we say goodbye to broadcast’s dominance as a dying relic of the 20th century, what can we do as long tail video publishers to maximize our audience reach, engagement, and monetization in the TV Web world? The answer is to be found at the top of search results! The immediate solution to being found is to caption our videos and paste the transcripts into our web-pages. Adding transcripts to video web pages immediately lifts search results. For organic search, there’s no reason your videos cannot be on the first page. The more niche and focused your content, the higher your search rankings. Captioning on Dotsub is easy, fun, and free. All you need to do is create a Dotsub account, upload your video, and our free service lets you caption, download the transcript, publish to your YouTube, BrightCove, Kaltura, Ooyala, LongTailVideo, or Wistia account–and more. For little cost, you can also order burn-ins, voice dubbing, or have Dotsub professionally caption or translate your videos.If you have more than 100 minutes of video on the web already, we’ll even caption and translate up to 10 minutes as a free trial. If you have less than 100 minutes, you can sign up to use our platform and do it yourself.